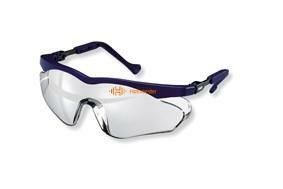 - Extremely lightweight and fashionable protective eyewear. - Lens and frame made of high-impact plastic. - Soft temples, individually adjustable by integrated pull-off locking. - 100 % UV protection. - Side shields offer additional glare protection. - Very lightweight at only 38g. - Available also with clear frame = uvex Skybrite SX2. Coating: outside extremely scratch-resistant, inside permanent anti-fog coating.